Address: 3600 Lom, 28 Hadzy Dimitar Str. First school year was in 1892-1893. The new school “Konstantin Fotinov" had been starting with six classrooms and 300 students, and the training had been conducting separately for girls and boys to the late 19th century. The name of the school was chosen in 1894 at the same time with the 50th anniversary of the magazine "Lyuboslovie." In 1896 school garden with fruit trees, flowers and crops in order to conduct practical classes was being set. 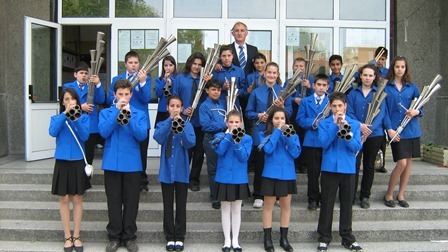 In 1908 with a donation of Dimitar Kiosev near the school was built a new one with four classrooms. The name of the school is took the name of the donor who donates also 22 000 leva for poor children. It was open free dining room in 1935. In 1927-28 was finished upgrading the second floor of the school building, already known as "Second high school". 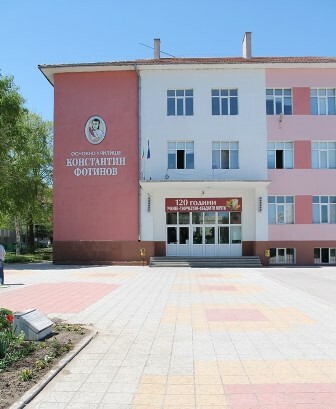 The number of students had been grown up and in 1961 the school was divided into Primary School with principle Tzvetan Goranov and Low secondary School (1961-1970) with Kipra Popova as principle. In 1969 was opened the new building for students from grades 5-8, which adopted the name of Bulgarian poet Hristo Smirnenski. In 1970 the primary and low secondary school had been reunited as "Hristo Smirnenski". From 1970 to 1985 the school was basic experimental and solve current problems of pedagogical theory and practice. In 1983 the school was awarded with "Cyril and Methodius" I degree of overall activity. 1990 година е възстановено старото име „Константин Фотинов“ с директор Цецка Калчева. In June 1991 was launched half-day preparation group with extended learning of English. During the 2003-2004 school year the school started first in the country working on the program "KEAR" - "Integration of children with special educational needs in mainstream schools". In 2004 the school applied for volunteer from Peace Corps - English teacher, and received approval. In 2004-2009 Rachel Gilmore and Amy Dyang, followed by Illyria and Turk were hired as volunteers. Working with teachers from Peace Corps assists students in learning English, American culture and traditions and it was create a rich library of literature in English. On March 29, 2006 was open the first Children's Police Academy (CPA) in the region. Under the slogan "Let us work together to grow our children free, studious and responsible citizens" started a joint project of the Regional Police Department - Lom and school "K. Fotinov"- Lom - Children's Police Academy as part of the national strategy "Police close to the society". On the first anniversary of the Academy officers from Regional Police Department Lom awarded the titles "junior volunteer" and "senior volunteer", other awards and the flag of CPA had been consecrated. Nowadays Second low secondary school "Konstantin Fotinov" with director Anna Svetoslavova (from 1995 up to now) has teaching team of 37 qualified teachers. The school has built clubs on different activities, sports sections, issuing a school newspaper "Lyuboslovie", cheerleaders; acrobats in recent years won over 100 gold and silver medals at national and international competitions. Over the past decade were realized the following projects: "Construction of a center for physical culture and sport", "Integration of the Roma population", "Prevention and integration of children with disabilities", "The Legacy of Europe- traditions alive" and others. In the new century, teachers, parents and students which number is 520 - from the preparatory group to VIII class - work in a spirit of trust and in accordance with the requirements of modern society.